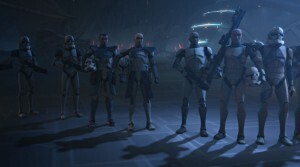 When Season Four previews showed up last summer, the season was dubbed “Battle Lines.” We were given glimpses of the unfolding underwater warfare on Mon Calamari and an image of the clones assembling in a classic band of soldiers shot. Did The Clone Wars create a season arc that delivered on that tag line? Lex: Not really. “Battle Lines” gives the impression of focusing on the war, and the conflict between the Republic and the Separatists. To me, the real theme of Season Four is loyalty, and how the characters’ allegiances and values are tested: Rex and the 501st with Krell, Anakin on Zygerria, Ahsoka’s feelings for Lux and his choices about the Death Watch and his future, Obi-Wan undercover as Rako Hardeen and Anakin’s reaction to the lies he was told, Ventress with the Nightsisters and then her own future alone, and Savage’s dedication to finding and rehabilitating his brother Maul. There are some really great stories in there, but they don’t have much to do with the actual war. Megan: The tagline fits certain parts of the season, such as the Krell arc and the Mon Calamari battle, but I agree with Lex that it is not a sufficient descriptor for the season as a whole. There were certainly a lot of battles – the Gungans’ conflict against Grievous was surprisingly intense. However, this is Star Wars: The Clone Wars. That’s two “wars” right there. We know there are going to be battles. 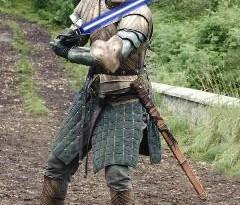 There were a lot of episodes focused on individual characters, though, who crossed battle lines: Asajj leaving the Nightsisters and taking up with Obi-Wan, Anakin going undercover as a slaver, Obi-Wan masquerading as a bounty hunter. I think the tagline was meant to draw attention to the physical battles instead of the crossed moral lines, but it applies to the latter as well. Tricia: The “battle lines” certainly aren’t what I expected going into the season. The Mon Cal arc, “Shadow Warrior,” and the Umbaran arc set the story right down in the middle of actual battles, then we were given more of a social level battle line being drawn in the Slaves of the Republic arc, when Anakin is forced to confront slavery and Obi-Wan his role as a Jedi while being held captive with the Togrutans. The Bounty Hunter arc started drawing the line in the sand between Obi-Wan and Anakin, a moral crossing of lines as Megan pointed out. For me the Asajj two-part arc fits less into the theme, but that may be suited for more discussion later, and of course the reappearance of Darth Maul creates another battle line for the Jedi and potentially even for the Sith. The storytelling design shifted from three-part arcs and single episodes from the previous season to a majority of this season playing out in four-part arcs. How do you think this worked for or against the show? 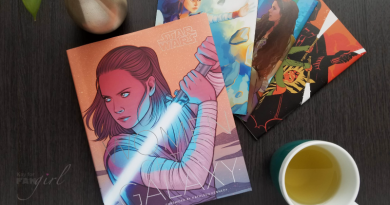 Lex: This season was much more character-driven, really moving forward with the character development of Anakin, Ahsoka, Obi-Wan, and Rex, as well as Ventress and Talzin, and to a lesser extent Dooku. The longer arcs seem to facilitate these characters arcs a lot better than single or double episode stories, but in each of the four-part arcs I thought there were some odd choices of pacing, spending a bit too much time on one less-interesting aspect of the story, then having to rush through another more-interesting part. Megan: The three- and four-part arcs really made this season stand out. The longer format allowed slower-paced episodes. One of my favorite scenes this season is when the clone troopers are talking in their dormitory during the Krell arc, and a scene like that could been cut if they had fewer episodes in which to develop the action. I’m looking forward to more long arcs in Season Five. Tricia: The longer arcs had their advantages and disadvantages. I really enjoyed getting some meatier stories and scenes that we might not have seen otherwise. Stories tend to move in three parts, and generally not all those parts are the same size. Drawing the arcs out resulted in some extraneous storytelling that felt like it was there to hit the time. For instance, I really liked “The Box” as an individual episode, but I’m not sure it was necessary to the arc. I wonder if that episode might have been better spent on Anakin, Ahsoka, or Padmé, who got very little development this season. Overall, a broad range of characters had development, but the season as a whole felt a bit unfocused. It reminds me of Lost during its middle seasons when it meandered a bit. Filoni and company have been coy on whether they have an endgame in sight. We’re also hearing a lot of mention that there are many stories to be told. I came away from the season feeling a bit like the tour guide doesn’t have a good sense of how or when we’re supposed to end this ride. Do you agree? Lex: The characters are gradually moving toward Episode III, but the plot doesn’t seem to be going anywhere. The longer arcs of three or four episodes have definitely allowed more depth to the character development, but the series has a whole still seems to have the feel of the “vignettes from the war” style of the first two seasons; we’ve just moved from shorter to longer lengths of those stories. I think arcs like Umbara, Zygerria, and Undercover Obi would be even better if they moved the war forward, too. Megan: In my opinion The Clone Wars has never had a clear direction. When the show began I expected the episodes to be more connected to one another and the finale to wrap up plot points instead of introducing new characters, but four seasons have proved that expectation wrong. The Clone Wars is definitely lacking in a sense of direction now, but that isn’t a problem specific to this season. Tricia: That’s true, Megan. The first couple of seasons were just little vignettes. Season Three felt more driven, particularly at the end. It had a purpose. Season Four started slow. At the end some of the earlier storytelling decisions, like the seemingly random Droids episodes, felt like it had some purpose by the way of introducing Orphne – a character that gives more insight into how some beings are connected to the Force. I saw threads like that starting to weave into the last arc, but I never felt like The Clone Wars story supervisors tugged on those and made the season cohesive. Beyond the direction of the story, do you think the series has been consistent in who these shows are aimed at? Megan: It’s clear that the series is aware of the age gap in the fanbase. Especially Season Four has been bringing in darker, more violent episodes for adults and Wizard of Oz episodes for the kids. Instead of finding a middle ground, the tone varies a lot from episode to episode. Is remaining inconsistent a form of consistency? Tricia: Just watching the advertisements can make me feel a bit schizophrenic. Nerf followed by manly man deodorant then a Barbie ad? Looking at it as a business person I think The Clone Wars is struggling to remain true to the Cartoon Network, who gave them the chance, and what they really want to do with the story, which is be an adult show. Perhaps that’s why we see Wizard of Oz episodes, to appease their network, propped up against gritty realistic takes on the perils of war. Sometimes the shows are very adult and expect the audience to make mature leaps of imagination about the themes and storytelling, and other times there are scenes that are blatantly childlike in their absurdity. It hasn’t bothered me when those extremes are consistent in an episode, but when they exist in the same episode it becomes jarring. The Mon Cal arc was highlighted at last year’s San Diego Comic-Con. The episodes kicked off the season, braving new techniques to accommodate the underwater setting. While the second season closers, “Padawan Lost” and “Wookiee Hunt,” broke animation ground the storytelling seemed to be given equal weight. Was it just me or did the Mon Cal arc signify a trend this season that put more importance on creating cool effects and less thought into the stories themselves? Lex: I was okay with the idea of Riff Tamsin being a caricature of a moustache-twirling villain (minus the facial hair), and being revealed in the end to just be another disposable pawn of Dooku’s. But I think the arc would have had more heft to it if they’d done more with Prince Lee Char and given more depth to his character. Either that, used the trilogy to do more with Anakin’s fear for Padmé or to progress Ahsoka’s development in some way. Megan: I agree that the episode was a lot less exciting from a writing standpoint than from an animation standpoint. The Mon Cal arc seemed a bit vacuous, focusing on set-piece battles instead of characters. As a Kit Fisto fan I was especially disappointed that he was too busy dealing with plot and giving orders to have the joyful, humorous sort of characterization he’s had elsewhere in the EU. When I reviewed “Water Wars” on my blog I noted that the trailers had emphasized action, so I should have known what was coming, but that doesn’t mean that I have to enjoy the writing. Tricia: I enjoyed Riff Tamsin, his Jaws-like portrayal, and how he worked within the arc. There have to be some conceits, and in order to see the heroes be successful they have to introduce new bad guys – or as they’ve been dubbed, the villain-of-the-week – who will be defeated. Throughout the Mon Cal arc we saw Ahsoka, Anakin, and Padmé, with no real character establishment. The things they did simply reinforced what we knew about them. Prince Lee Char had the biggest character growth, which I felt was plotted in a way that catered to the younger audience. Looking back though, it seems like the character development for the Mon Cal leader is a bit superfluous when other important characters to the series got little or no real screen time. That’s not to say I didn’t like the technical achievements of the Mon Cal arc, but it ended up giving me the impression that they were practicing for Lucas Animation’s next job rather than telling a story. 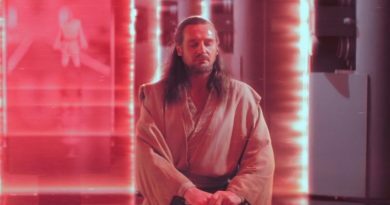 On the other hand, “Shadow Warrior” – as a standalone episode – stood out for the story it told with Jar Jar, General Tarpals, Anakin, and Padmé. What did you think of this episode? Lex: I actually really liked that it showcased the strength of the Gungan’s military power – it’s called the Grand Army for a reason. Jar Jar is clumsy, but Episode I did a good job showing that the rest of the Gungans are warriors, and it makes sense that a big team of them, led by Tarpals, could take down Grievous. 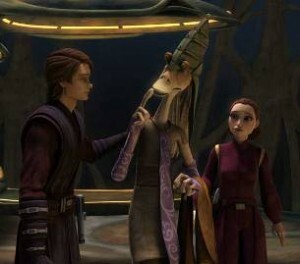 And despite his comedic role, Jar Jar has always wanted to help out and wanted to do the right thing. Showing him muster some courage to help his people, and not mess up the whole thing, is a side of him that I hope we see more before the series concludes. Megan: Especially after the bit of a setback that was Mon Cal, I loved “Shadow Warrior”. 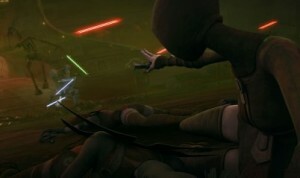 The death of Tarpals and the impaling of Grievous were one of the darkest, most ambitious moments in The Clone Wars. Despite Jar Jar and the mysterious magic, “Shadow Warrior” held together really well and told a good story about warrior Gungans, without sacrificing Jar Jar’s characterization from The Phantom Menace. We also got to see Padmé under pressure, making a big decision that could change both the war and her married life. “Shadow Warrior” tied action and characterization together in a way the two previous, more anticipated episodes did not. Tricia: Definitely this episode highlighted what the team is capable of – action, story, character development. I thought this was one of their better pieces for the season. I understand why they’re creating these longer arcs, but I think stand-alones like “Shadow Warrior” prove that the series would be well served with a better balance of arcs with these singular episodes. That concludes Part One of our Season In Review for The Clone Wars Season Four. Check back next week for Part Two, when we’ll discuss the Droids, the Umbara, and Slaves of the Republic arcs. This was such a great review. I agree with most of what was said and am hoping to get a more cohesive season 5 to really glue all the pieces that they have out there together.